Moving from the authorized tie-in TP books to the show itself, in this piece I will speak about seasons one and two. The next part will tackle the theatrical prequel Twin Peaks: Fire Walk With Me (1992) and will include a few notes on the episodes that have aired already in the Showtime series known officially as Twin Peaks: the Return. The original series was indeed a sensation — not just a cult hit but a really popular show in its first season. Even later, when it was “dying in the ratings,” it was still getting millions of viewers, a feat that most network shows can rarely do these days. In its first season and the better episodes of the second season, the show was a sublime spoof of night-time soaps (in case viewers weren't getting it, a daytime soap, “Invitation to Love,” was watched by many of the characters). It also was a brilliantly subversive show because it not only delivered a perfect satire of a night-time staple (at least in 1989-91) but it also was a prolonged “dream,” thanks to surreal sequences crafted by co-creator David Lynch. It was also a highly emotional program, which focused on (depending on the scene and the episode) those three fave emotions of depressives everywhere, grief, guilt, and fear. The best episodes reward multiple viewings. Sadly, the worst episodes, all from the second season, are very hard to slog through (more below). The show did, however, recover from its jumping the shark to end on a high note, but by that time it was already in the “discard bin” at ABC. One of the finest aspects of the show was its ensemble cast. It was divided between attractive leads and quirky character people. It was a winning combination, which made the eccentric characters seem even more fun because there were “normal” characters around to offset them. Michael Ontkean as Sheriff Truman, Peggy Lipton as Norma Jennings, Everett McGill as “Big” Ed Hurley, Michael Horse as Deputy Tommy “Hawk” Hill, Warren Frost as Doc Heyward — these cast members didn't have any wonderful taglines, music cues specific to their characters, or moments that will be remembered forever, but they grounded the events of the program. Mark Frost's experience as a scripter and story editor on Hill Street Blues surely served Twin Peaks well, in terms of creating a show that could function as a normal drama, but also had effectively creepy bits of horror and way-out quirky sequences. 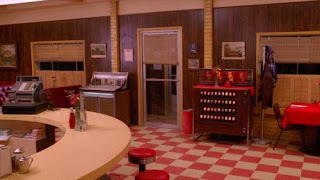 The pilot film (which, in the U.S. Blu-ray box set contains the European theatrical ending, in which BOB is summarily caught by Truman and Cooper) is a model telefilm that devotes attention to both plot and characters (thanks to Frost) and mood, tone, and visual stylization (thanks to Lynch). 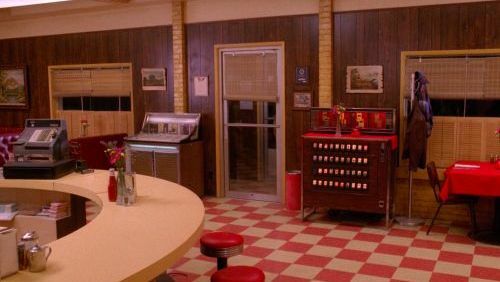 The seven episodes that came after the pilot to form the first season are equally involving and beautifully timeless, as the show takes place in 1989, but focuses on a town that seems oddly stuck in the 1950s. On rewatching the first two seasons of Twin Peaks, one is struck by a few things. First is the way that Lynch harkened back to film noir in many ways in the series. The most obvious was the names (his FBI chief is named “Gordon Cole,” a character in his favorite movie, Billy Wilder's Sunset Blvd). Along with this, a number of the characters smoke, a definite throwback to Golden Age Hollywood filmmaking. Lynch also has his characters do this on the new Showtime season of the show — one has to admire his unwillingness to shed the cinema's past in order to appease those who would issue “trigger warnings” to those individuals waiting to be offended by something or other. David Lynch and Mark Frost have done hundreds of interviews over the years and have spoken many times about certain aspects of the show and its history. 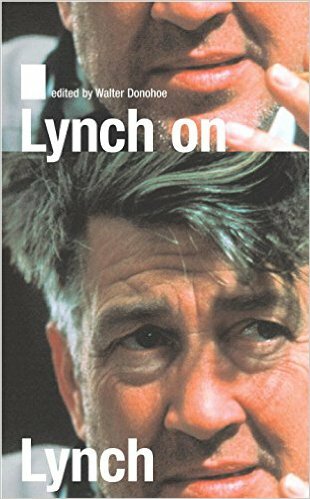 For reference purposes I will note that the best books about Lynch are without question Lynch on Lynch, edited by Chris Rodley [Faber and Faber, 1997, updated in 2005, Farrar, Straus, and Giroux] and David Lynch: Interviews, edited by Richard A. Barney [University Press of Mississippi, 2009]. Lynch has also published one short book containing his philosophy about making art, Catching the Big Fish [TarcherPerigee, 2006, reissued in 2016]. One of the best books about Twin Peaks is The Essential Wrapped in Plastic: Pathways to Twin Peaks, by John Thorne [John Thorne, 2016]. The book contains Thorne's essays from the long-running TP zine “Wrapped in Plastic”; the most valuable aspect of the book is his inclusion of quotes from the cast and crew, taken from interviews in the zine. Also interesting is his analysis of the audio commentaries that accompanied the first U.S. release of the show on the Artisan DVD label. The 10-disc Blu-ray box set Twin Peaks: The Entire Mystery [Paramount, 2014] has all of the elements of the show, from all the episodes and the “prequel” feature film to a whole movie's worth of outtakes from the latter, plus many, many supplements. But the audio commentaries (which mostly featured the show's directors) have not carried over to this recent “complete” box set. Thorne has included a portion of this material in his "Over the Convenience Store" blog. When Twin Peaks was at its most inventive and stylish, it was among the best things ever to air on American TV. It sadly jumped the shark in the second season and several episodes were so bad that they nearly undercut the show’s initial brilliance. As I noted in the first part of this entry, the show got better toward the end of the second season, when the Windom Earle plotline finally kicked in. 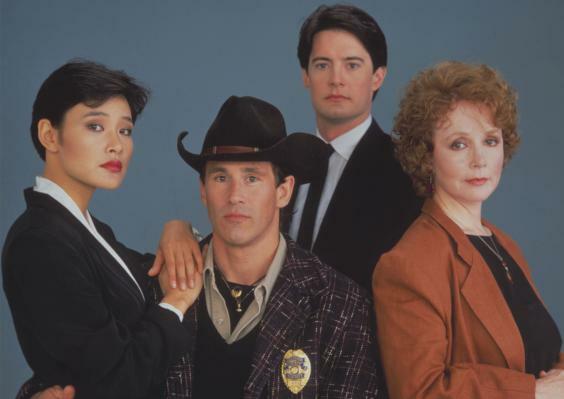 The fact that the show became sadly feeble after ABC demanded that Lynch/Frost and company reveal who killed Laura Palmer is now acknowledged by everyone involved — by Lynch, the writer-producers, and various members of the cast. The question of who was responsible for that steep decline in quality is something I’ll discuss below. The first culprit is, of course, the network. ABC promoted the show strictly as a whodunit and the American public quickly got into the swing of things. 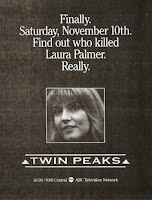 Although many viewers were into the show for its tone and characterizations, it did have a massive following who watched simply to see who killed Laura Palmer. ABC decided that the identity of the killer had been “teased” enough, although what Lynch and Frost clearly had in mind was to not reveal the killer for a few seasons and meanwhile build up the BOB storyline, exploring the way that evil was plaguing the community. Frost has noted in interviews that he felt there eventually had to be a point when Laura’s killer was identified. 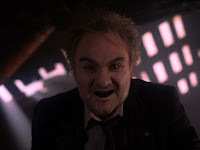 Lynch has noted he never wanted to name the human culprit who killed her, although both creators had agreed it would be Leland, whenever it was revealed. Clearly they had envisioned a series of plots in which BOB would be a factor, with a possible end revelation when they chose to stop doing the show (or it got cancelled). So, in essence, ABC can receive the most blame for undercutting the show. The network in effect sabotaged it by demanding a quicker revelation of the murderer — and they also kept winnowing down the show’s viewership by changing its timeslot (from Thursday night to Wed to the abominable Sat at 10:00 p.m. slot). One issue that arises from the revelation is whether or not Leland was fully guilty of his crimes (he also killed Theresa Banks in another town, and also terrified and bound up Ronette Pulaski). The episodes in which Leland is “unmasked” were indeed beautifully written, but there is a little game played as to whether Leland himself committed the murders, or if it was just him playing “host” to BOB. As John Thorne notes in The Essential Wrapped in Plastic, Cooper absolves him of the murder, as he tells the dying Leland that he didn't do it. (He also assures Sarah Palmer that her husband didn’t kill their daughter.) This could be Cooper simply saying nice things to calm a worried family member and a schizophrenic who has realized what his “bad side” has accomplished, but it also was intended to keep the spirit of BOB alive in the show. Guilt and grief were definitely major engines for the show’s activity, but in some cases the supernatural was a key factor in the unexplained (or unexplainable) events. One thing was certain in the episodes in which Leland was unmasked — Ray Wise’s performance was absolute perfection. He did a great job from the beginning, and it should be noted that Wise had not been told that he was the murderer until the very last moment — he was simply acting as a crazy, distraught father. Emmy fare for sure, but naturally enough, he didn’t get one. — Ben Horne goes insane and believes he is a Civil War general. — Lucy the receptionist must figure out which of two men is the father of her baby. — Nadine becomes super-strong and goes back to high school in her 30s. — The town newspaper editor marries a young woman who proves irresistible to men. — James the cyclist gets caught in a James M. Cain plot in which he is the target of a bored, rich wife’s seduction (not mean to be funny, but equally awful). While ABC most definitely screwed the show by demanding that Laura’s killer be revealed, the key individuals involved in the show were also responsible for the surprisingly bad half-dozen or so episodes that followed the unmasking. Kyle MacLachlan stymied the creators and writers when he refused to do a plot line in which Cooper would have an affair with Audrey Horne. He felt that it was unseemly, given that Audrey was supposed to be 17 and Cooper was double her age. The writers have noted that the planned Cooper-Audrey plot line (which had been signaled all through the first dozen or so episodes – why else the “mental communication” business? ), intended to bridge the gap between the unmasking of Leland and the Windom Earle storyline. 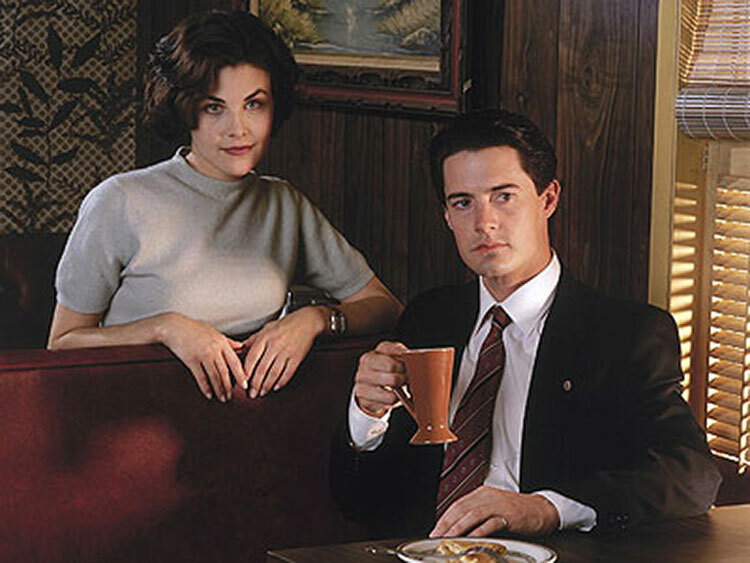 The strangest thing about MacLachlan refusing to do the Cooper-Audrey storyline (when Sherilyn Fenn was 25 years old at the time of filming) was that he was subsequently okay with Cooper having a romance with Annie Blackburn, who was college age. Heather Graham was, in fact, 20 years old when she played Annie. Was David Lynch somehow responsible for the tremendous dip in quality? He had left the show for a time during the first season because he was making Wild at Heart. It is noted, however, that Lynch was present for more of the second season, since he wasn’t making a film, and his character, Gordon Cole, is present in several episodes. So, was he just fed up with the show and felt that the solving of Laura’s murder had effectively killed it off? This is contradicted by the fact that he did an amazing job on the final episode (ep. 29), in which Windom Earle captures the “queen” (Annie) and lures Cooper into the Black Lodge. He’s been quoted in interviews expressing disappointment at the poor quality of much of the second season, but one wonders why he, as the show’s co-creator, let it get SO bad. The guilty party in this behind-the-scenes mystery is, of course, all of the aforementioned: ABC might’ve been the primary “destroyer” of the show in the second season, but Lynch, Frost, and MacLachlan didn’t do it any favors (until the final episode, which was too late — by the time it aired, Twin Peaks had been cancelled). One of the most valuable things in the Thorne tome is his detailed study of the final episode, which was completely rewritten by Lynch on-set. He ignored the finalized script for the show and proceeded to create a whole new series of events, leading up to the eventual emergence of the “evil Cooper” (which was, to everyone’s memory, where the show would’ve gone if it had been renewed). As supplements, I offer the following rarities that are now hidden in plain sight. 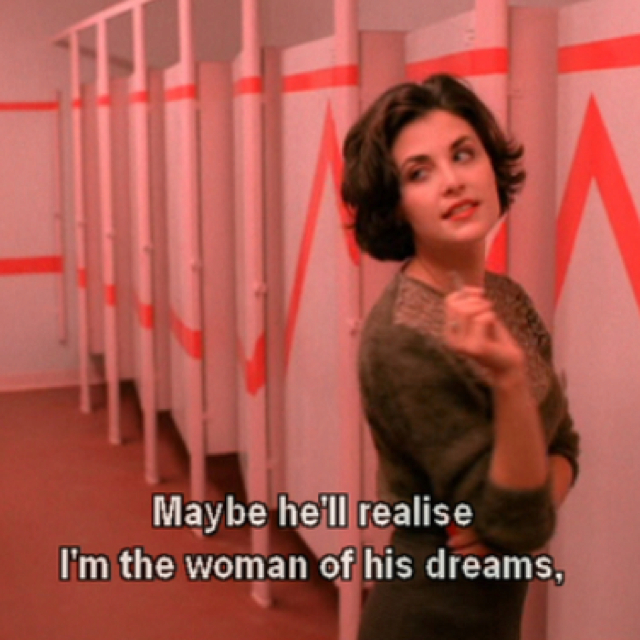 Firstly, a time capsule from the moment that Twin Peaks was the hottest thing on network TV. 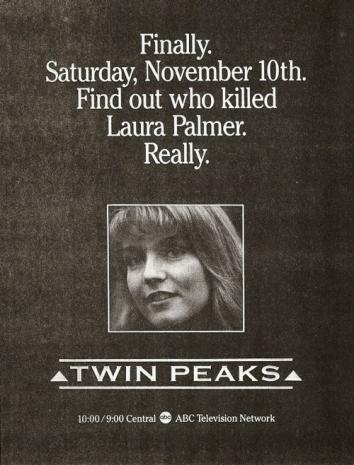 A “Donahue” episode in which five of the show's stars appear, and Phil takes a poll as to who the studio audience believes killed Laura Palmer. (Leland is with Agent Cooper near the bottom of the list!). The oddest item that was unseen in the U.S. until the advent of YT: four Japanese canned-coffee commercials that Lynch directed with several members of the cast. Lynch has done very little in a theatrical context, but he and Angelo Badalamenti did create one commissioned theater piece for the Brooklyn Academy of Music, called Industrial Symphony No. 1. The piece was made available on VHS but was only released on DVD as part of the “Lime Green Set,” an out of print 10-disc collection of Lynch's feature films. Here it is, in its entirety. Links to TP include Michael J. Anderson (“Little Mike,” aka “The Man from Another Place”) sawing some wood, and the lovely Julee Cruise floating through the air and singing songs by Badalamenti and Lynch. Lynch/Frost Productions only produced three shows in its short lifespan: TP, American Chronicles (a failed documentary series show on Fox that was mostly the creation of Frost), and On the Air, a very broad sitcom. Set in 1957, the show depicts the production of a variety show starring a washed-up Hollywood star (Ian Buchanan), who is constantly upstaged by his ditsy blonde costar (Marla Rubinoff). Lynch has been justifiably proud of three of his early shorts — “Six Men Getting Sick,” “Alphabet,” and “The Grandmother” — and collected them in the one DVD of shorts that he released (and also allowed them to be included as bonuses on the Eraserhead Criterion DVD). Three other rarities only appeared on the “Lime Green Set.” The first of these is the very primitive but totally Lynchian “Absurd Encounter with Fear” (1967) His then-wife Peggy is the girl in the grass. “Fictitious Anacin commercial” (also '67) is the second rarity. The star is a young Jack Fisk, noted production designer (for Lynch, Malick, etc). “Sailing with Bushnell Keeler” ('67 again) is a home movie shot and edited by Lynch. There is a quick glance of young Lynch, with his always-impressive full head of hair. Forget friendly, odd remarks, forget coffee, you can even forget smoking — the hair is probably his most-recognized attribute.